With the 3M LED Tape Light--Multipurpose, it is easier than ever before to make what is bright, brighter, and what is dark, light. Enjoy the brightness and reliability of 3M's most advanced Solid-State LED technology, combined with the durable versatility of a low-profile battery powered strip that works right out of the box. Simply add batteries and apply for 12 hours of high-intensity light. 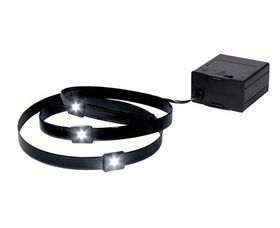 Comes in a thin, 3-foot flexible strip with a battery pack that can be easily attached, mounted or hung -- No messy electrical soldering, bulky adapters, or hazardous exposed wires. Illuminate closets, tool boxes, work benches, trailers, and cast light into the darkest corners anywhere and everywhere you need it.